It was my birthday last Sunday. 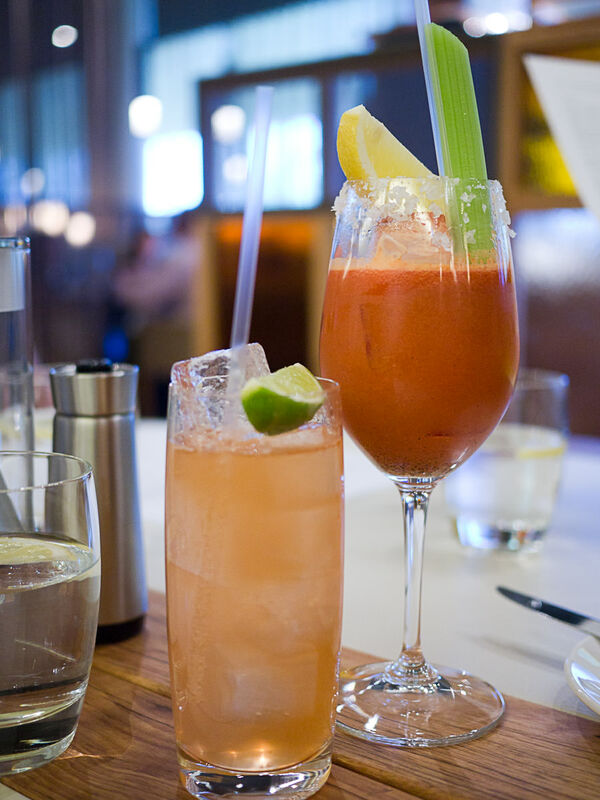 What better way to celebrate than with an epic lunchathon with Jac, Juji and Jay at Rockpool Bar & Grill Perth? We made our reservation over a month in advance and after all the hype in the lead-up to its much-anticipated late January opening, we were really looking forward to this meal. The menu is printed daily on a foolscap sheet. It’s three columns of mouthwatering reading and pure torture for the indecisive glutton. The staff seemed to understand this and did not pester us to order quickly. 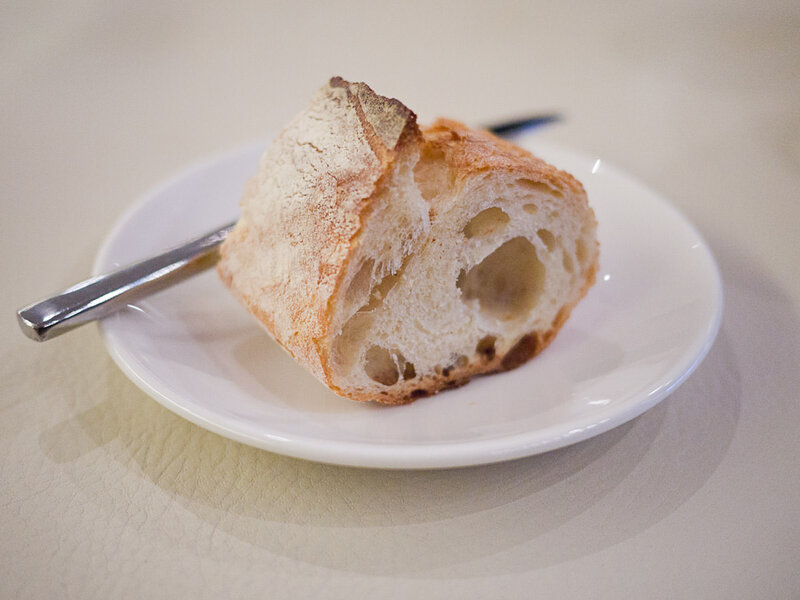 The bread is supplied by Perth boulangerie patisserie Jean Pierre Sancho and delivered to your table via silver service. It’s gorgeously crusty sourdough bread that you immediately want to pull apart with your hands, listening with pleasure to the crackle of the crust as you do so, then slather generously with soft butter. It has that wonderful smell of good handmade baked-that-morning bread. We were offered a second round of bread just before our main courses were served, which of course we eagerly accepted. Our starters were all seafood. 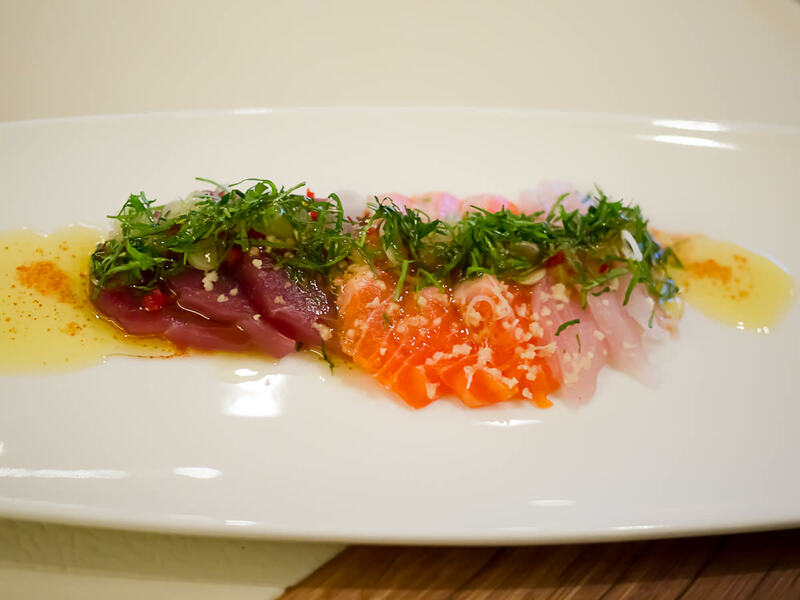 For her first course, Jac ordered the crudo of ocean trout, yellow fin tuna and pink snapper with ginger, chilli, coriander and lime flavoured extra virgin olive oil (AU$29). The fish was delicate and fresh, though two slices of snapper were a little stringy. 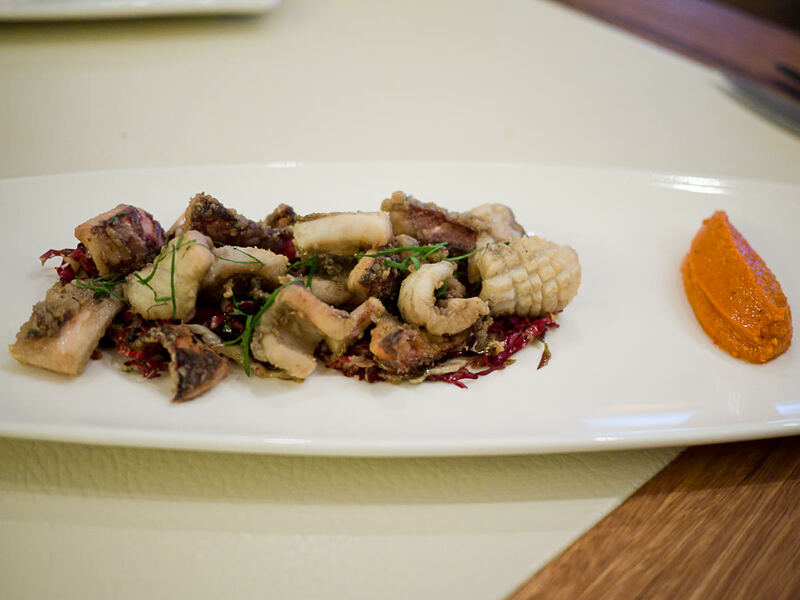 Juji ordered the fried calamari with romesco (AU$28). The tender bite-sized curls of calamari had been scored and rolled in seasoned flour before frying and were served on a bed of warm wilted finely shredded red cabbage with a hint of chilli. Jay’s first course was the four raw tastes of the sea (AU$29). 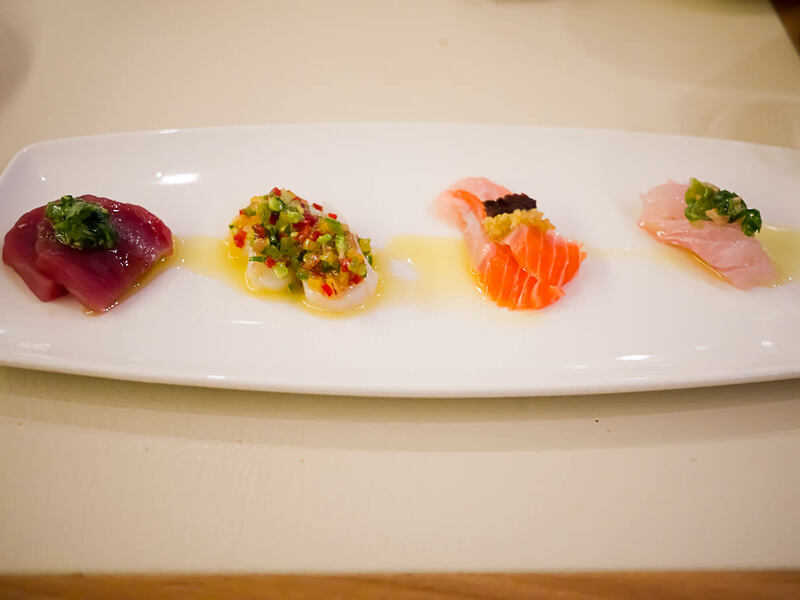 Left to right: tuna, scallop, salmon and snapper, all shinily dressed and daintily adorned. 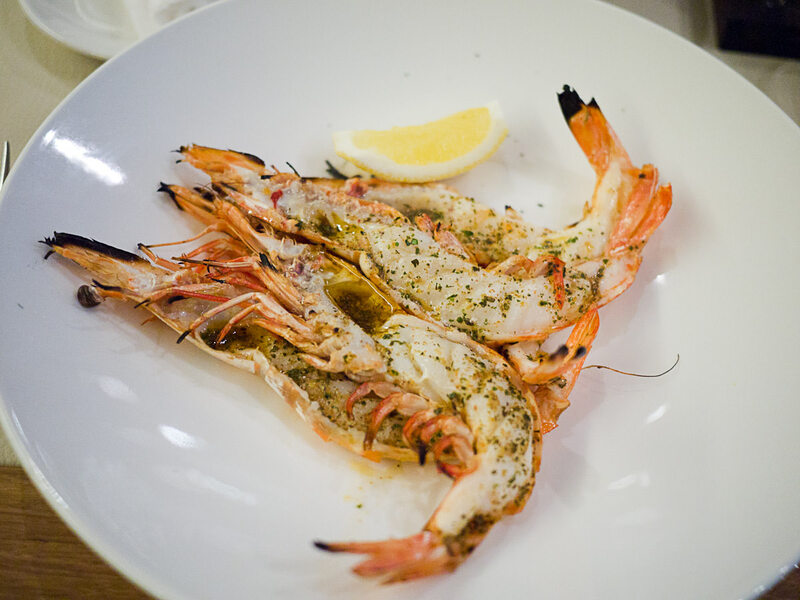 I ordered the charcoal roast king prawns (AU$30), marinated in garlic, herbs, chilli and oil and served split in half in their shells. As I always count my prawns I noted with interest that there were five prawn halves – I wonder what happened to the other half prawn? I enjoyed lifting the tender meat from the tail shells, eating the sweet prawn meat, then sucking on my oily fingers. I used my bread to mop up all the tasty oil in the shells and on the plate. 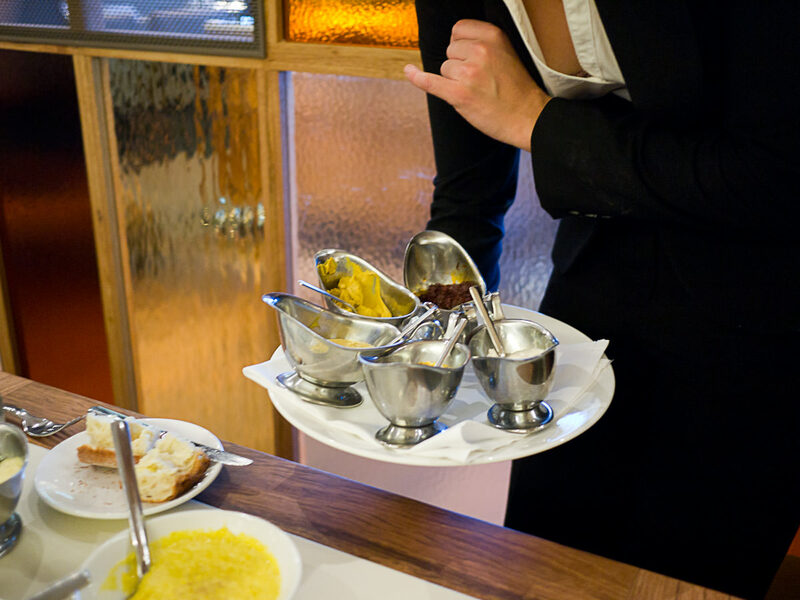 My prawn dish was served with two very important and much-appreciated accessories: a bowl for discarded shells (perfectly measured – all shells fitted perfectly within) and a rolled hand towel. 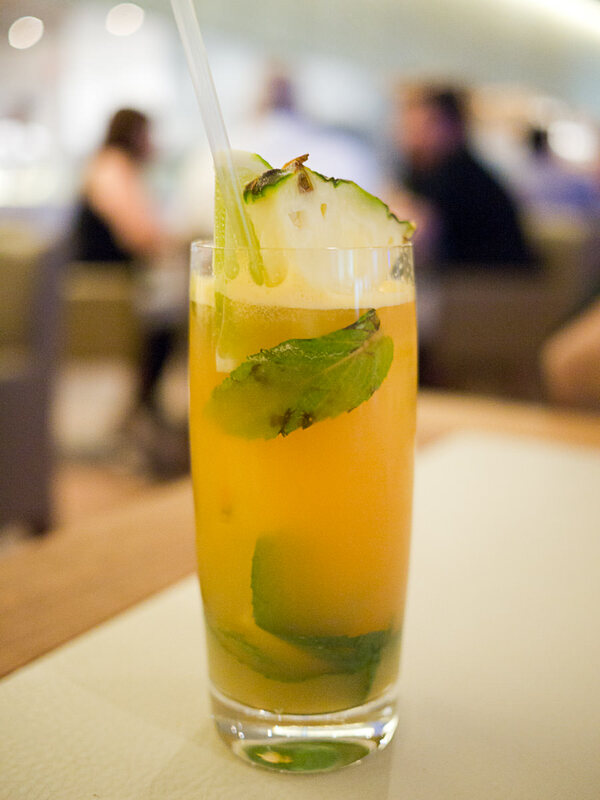 Juji and I ordered pineapple and ginger soda with Angostura bitters, fresh mint and lime. Be warned, the ginger flavour is intense and bitey and borders on medicinal. 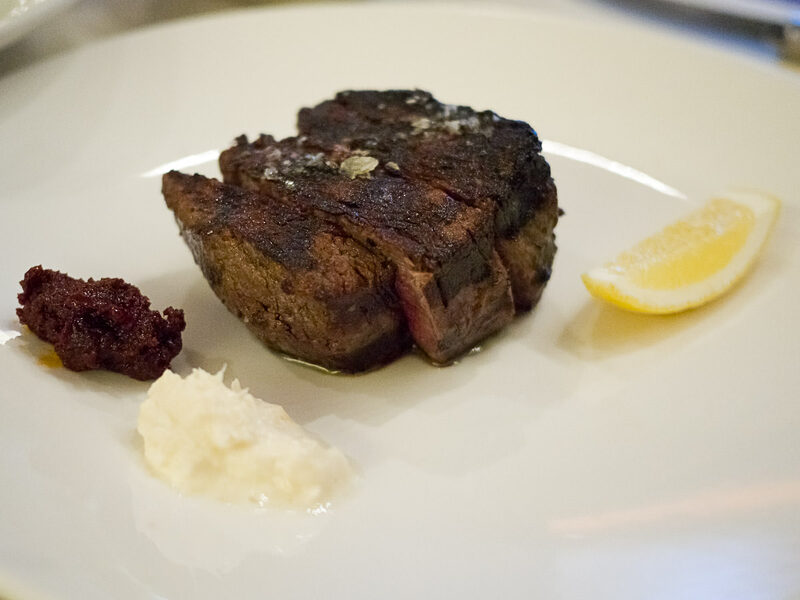 For her main course, Jac ordered the Rangers Valley dry aged 300-day grain fed fillet (250g, AU$69), which was served with a sprinkling of sea salt and a single wedge of fresh lemon. To Jac’s delight, she was offered a choice of sauces as soon as her steak was placed before her: harissa, barbecue sauce, mustards and horseradish cream. She chose horseradish cream and harissa. Being a big sauce fiend, she needed more horseradish cream halfway through her steak, which of course was no problem at all. Jac said she’d rate this steak among her top five steaks of all time, but the best steak she’s eaten was a fillet of Kobe beef at Friends restaurant in East Perth over a decade ago. Unfortunately, that was before my food blogging days so I have no photographic evidence. 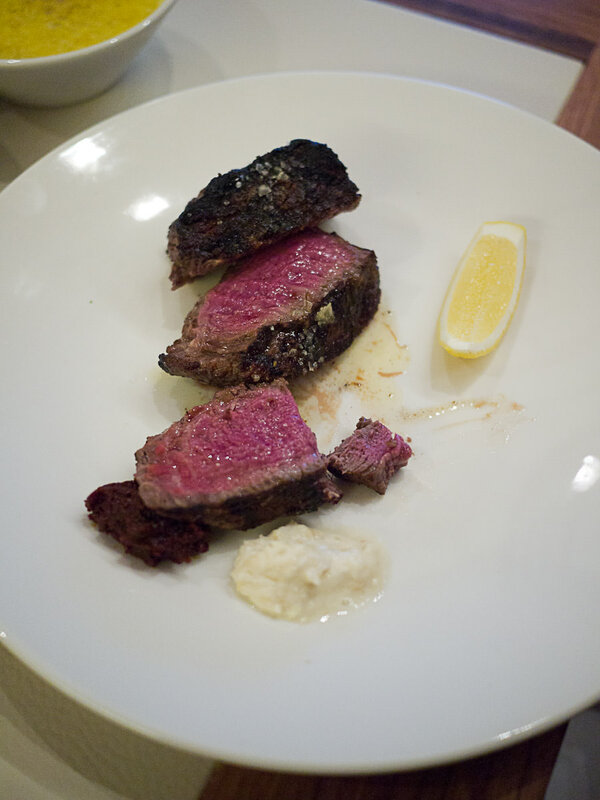 Juji ordered the Cape Grim dry aged 36-month old grass fed fillet steak (250g, AU$55). I don’t know how something that resembles blocks of petrified wood on the outside can be so beautifully tender and soft on the inside. With Juji’s steak, bearnaise sauce. 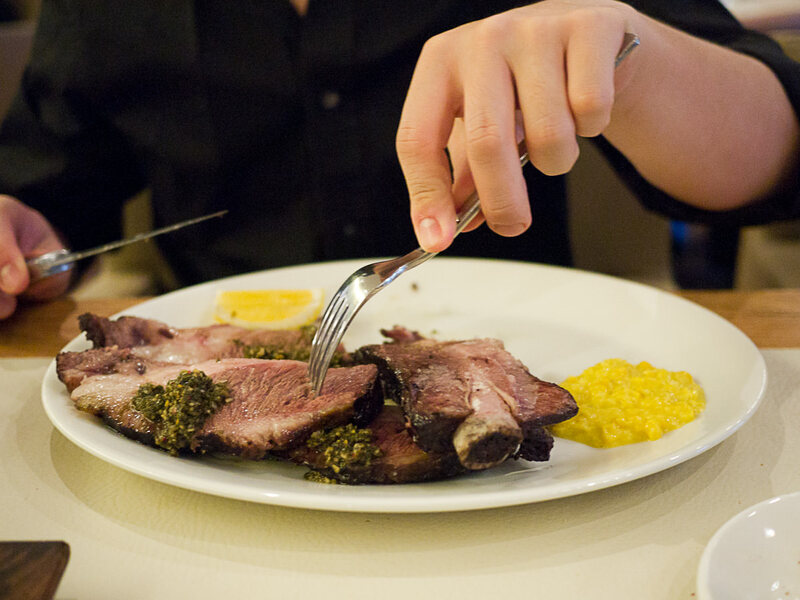 Jay’s dish, David Blackmore’s wagyu short ribs with chimichurri (AU$45), was the surprise showstopper of the entire meal. It was an intimidating, magnificent pile of meat worthy of being a Man v Food challenge. 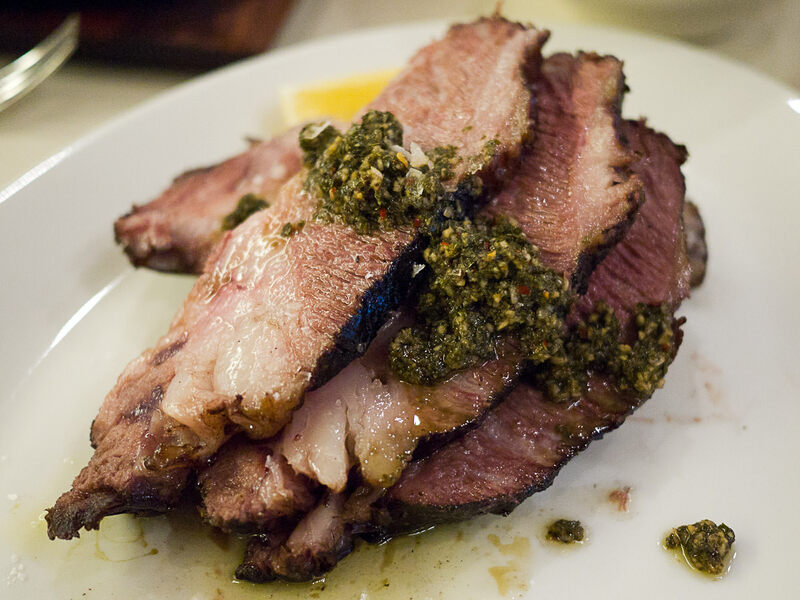 The hefty slabs of meat were charred on one side and marbled with thick bands of soft white fat, topped with chimichurri sauce (a South American version of salsa verde or green sauce, made with minced garlic, parsley, chilli and oil). A jug containing more sauce accompanied the plate of meat. We all tried the short ribs and were amazed at how soft and tender the meat was. Only the gentlest chewing was necessary. All the beef – the steaks and short ribs – cut like butter. 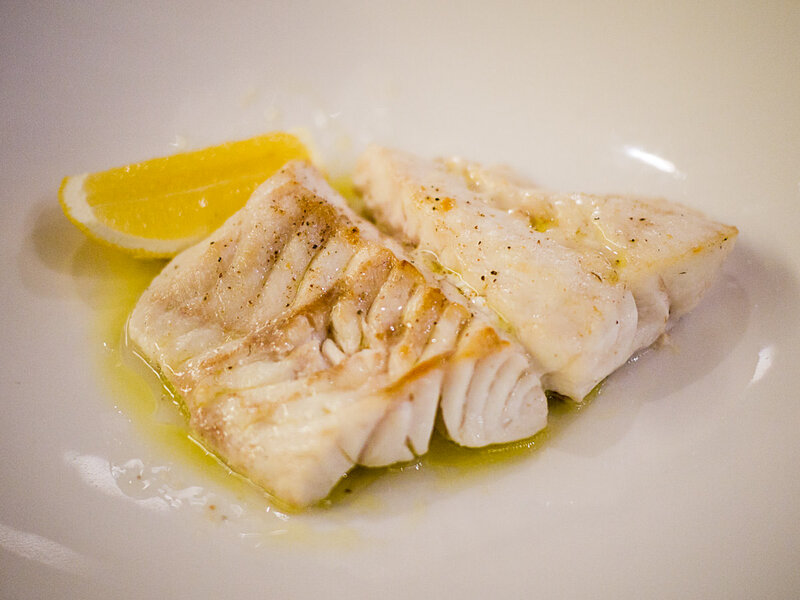 For my main course, I chose a second seafood dish – the bald chin groper (AU$55), served with a herb salad and aioli. Had the Jarrahdene pork been available at lunchtime, I would’ve ordered it; missing out this time just means I will have to come back for dinner. 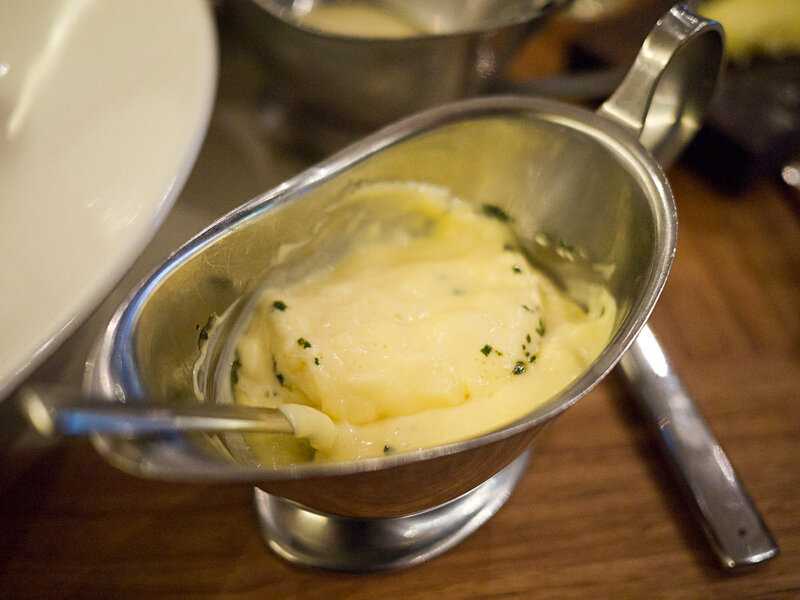 The aioli was creamy and full of finely chopped fresh garlic. 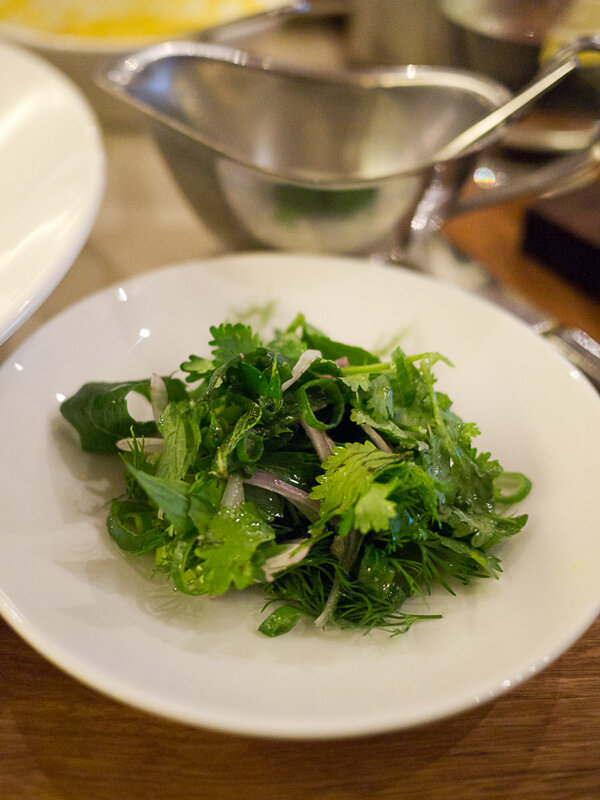 The salad of fresh herbs was dressed with a light vinaigrette. The beef and fish were all served with nothing else except a wedge of lemon, leaving plenty of room on the plate for salad or side dishes. We ordered four side dishes to share. 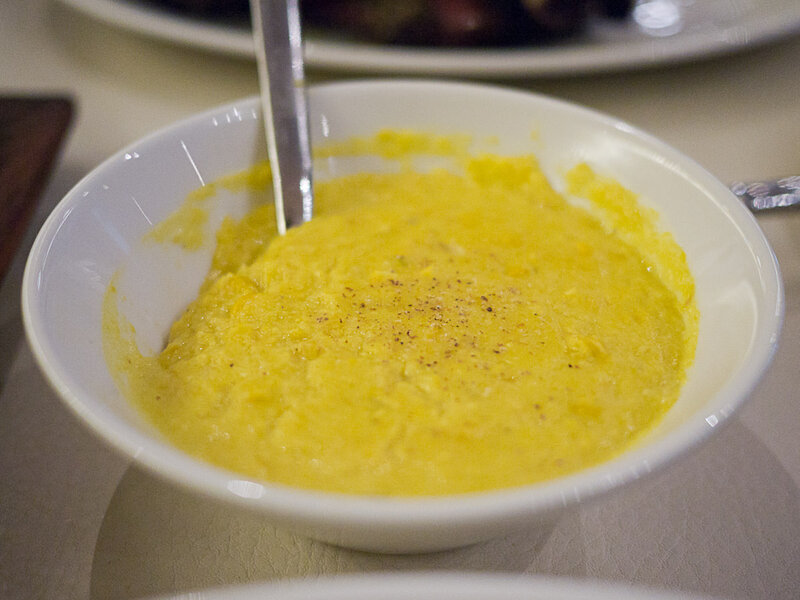 First, the creamed corn (AU$10). Some of you will probably say it’s outrageous that we paid $10 for a bowl of yellow vegetable goo, but it was wonderfully sweet, rich and bowl-licking good. No, I didn’t lick the bowl. Yes, I thought about it. We had a house chopped salad (AU$24), which was elegantly arranged in rows on the plate before being swiftly dressed and “chopped” table-side. 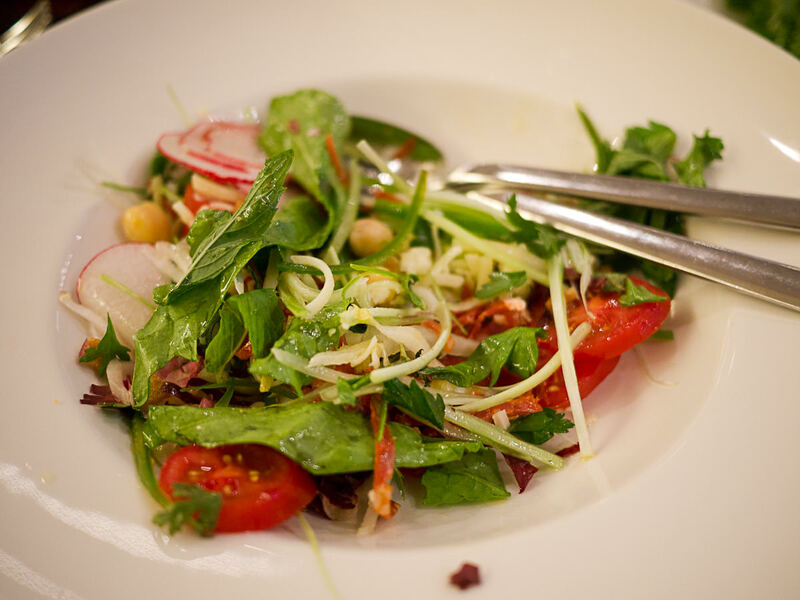 It was a lovely mixture of textures and colours, with salad greens, crunchy sliced radish, chickpeas, sweet tomatoes, chopped fresh herbs and mysterious soft leathery pink strips we discovered to be salami. 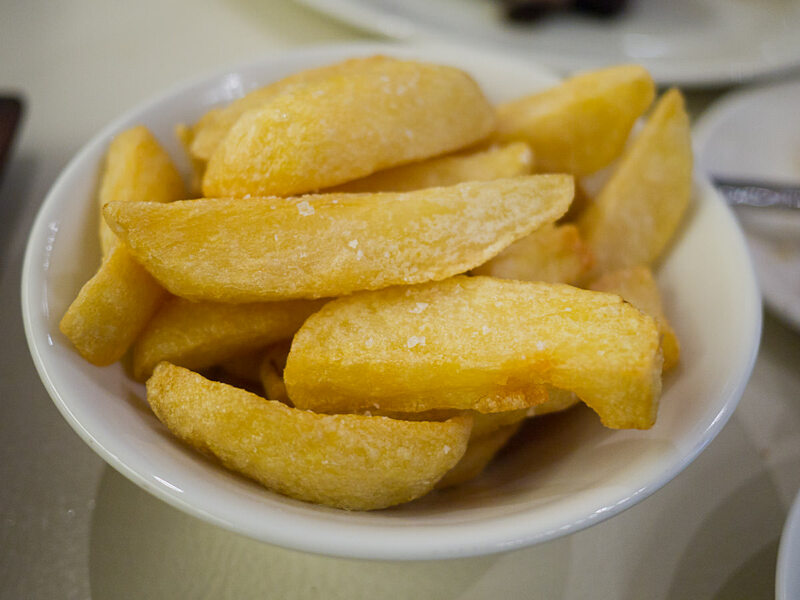 The hand cut fat chips (AU$12) could’ve been crispier. They weren’t anything special but improved dramatically when dipped aioli. 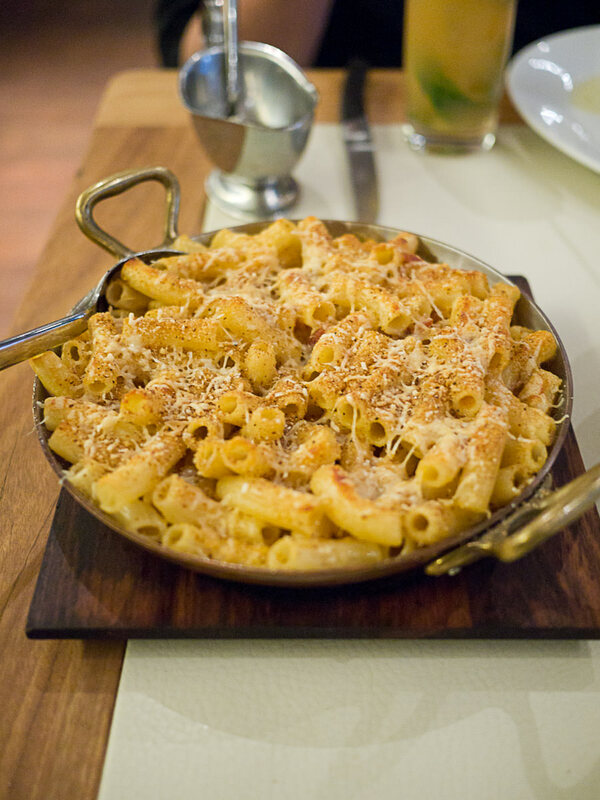 We are all fans of macaroni and cheese and ordered the mac and cheese (small AU$9 / large AU$11), presumably deliberately christened “mac” as a defense against macaroni and cheese purists who might point out that it’s been made using rigatoni. This dish is made to Neil Perry’s famous recipe featuring cheddar, gruyere and parmesan cheeses, but we were disappointed; it seemed overcooked, somewhat dry, with a grainy texture to the sauce. 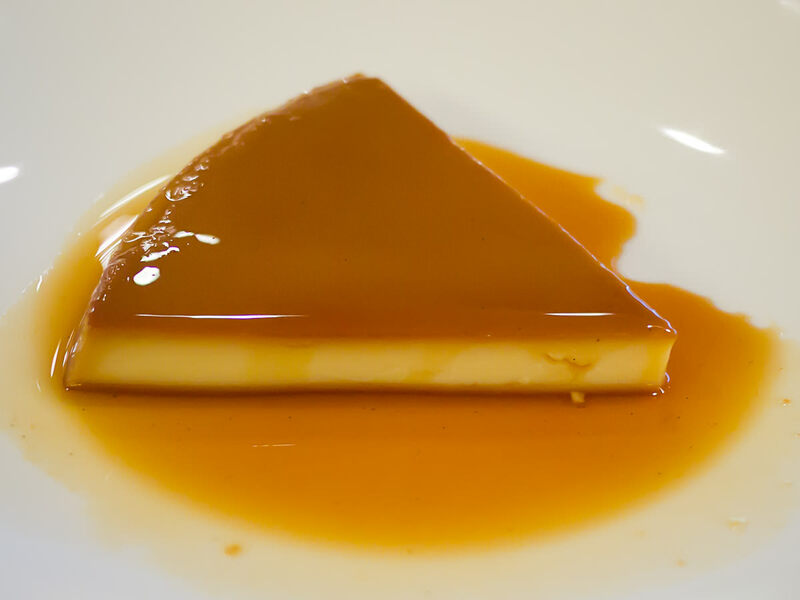 Jac’s creme caramel (AU$21) looked almost like a wedge of gouda cheese. The custard was silky smooth and served in a shiny pool of stunningly perfect caramel that I could practically see my reflection in. I couldn’t help but think of the enormous disc of creme caramel from which this wedge was sliced. 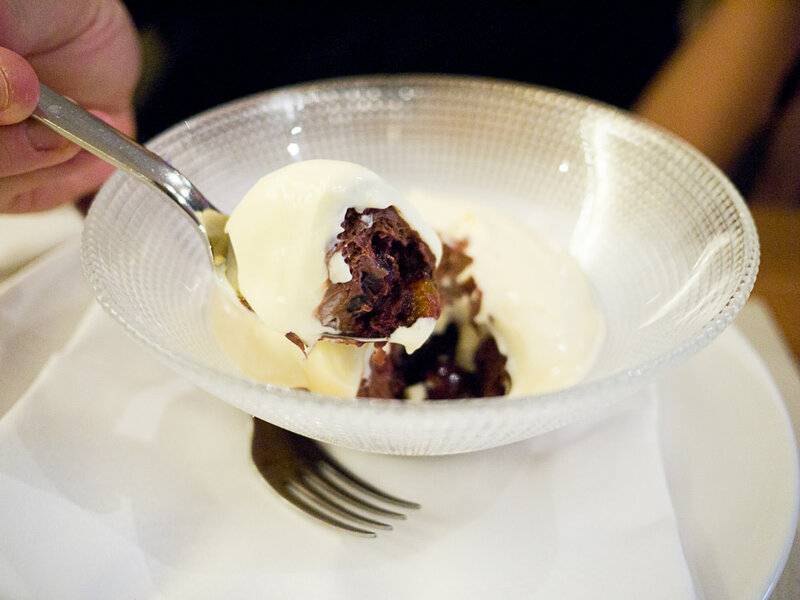 Juji and Jay shared the black forest trifle (AU$25), which didn’t look that impressive when it first arrived. I must confess when I looked at it I was reminded of the Rude Riddle from my childhood which I’ve referred to before: “What’s a mountain with a cherry on top?” My older sisters and I always giggled at our own audacity, we thought it was awfully rude and terribly scandalous – the answer was: a breast! 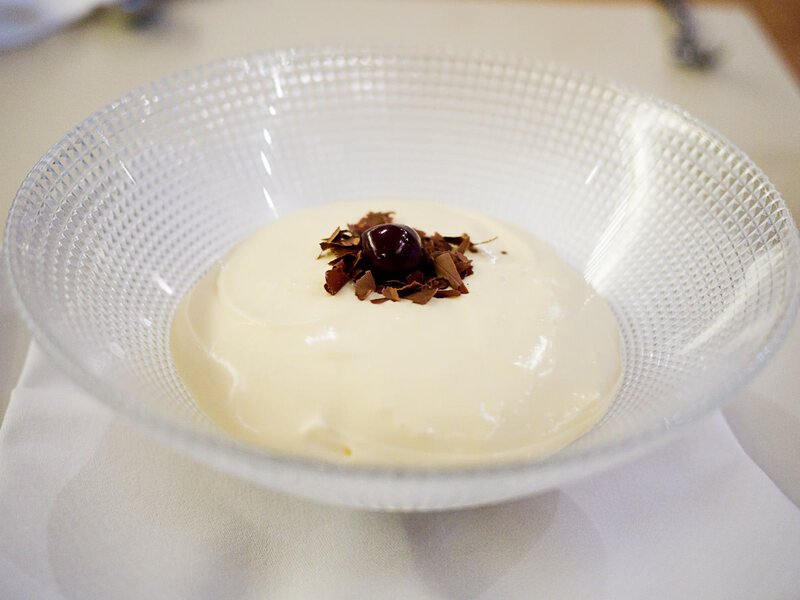 Beneath the “breast” – the top layer of sweet marscapone cream garnished with chocolate flakes and a glossy cherry – were layers of sweet and sour decadence: chocolate cake, liqueur soaked cherries, a sour jam (sour cherry, perhaps?) and rich chocolate mousse. The trifle was perfectly moist without being sodden with booze, like black forest cake often is. We plunged our spoons to the bottom of the bowl to capture all the layers in each mouthful. 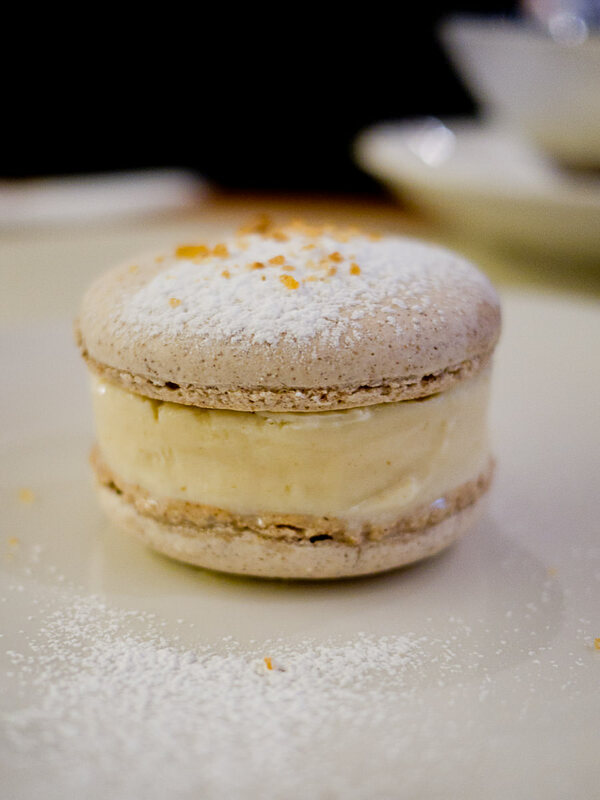 As a big macaron fan I just had to order the hazelnut macaron and banana ice cream sandwich (AU$14) – an extra large macaron with banana ice cream between its shells instead of ganache, creating a very special ice cream sandwich. The ice cream was absolutely bursting with the intensity of sweet, ripe bananas. 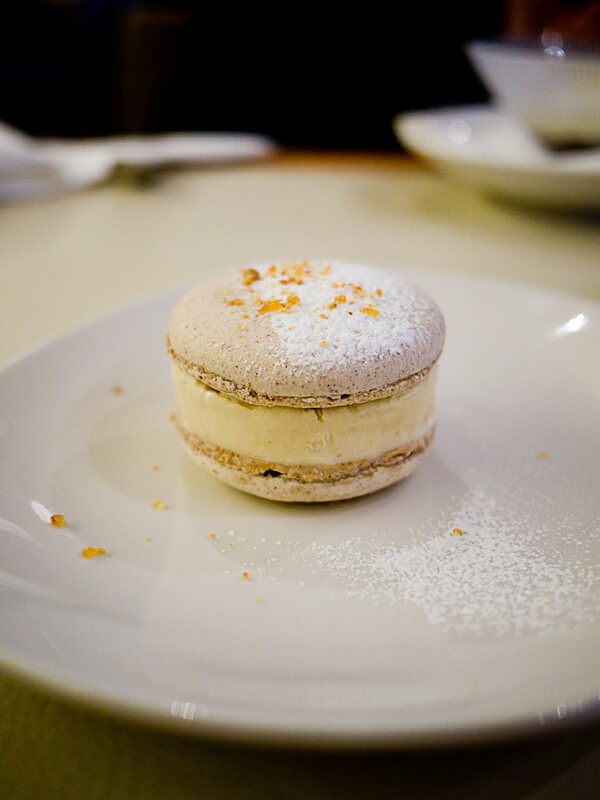 The hazelnut macaron had a crisp shell that cracked and collapsed under my spoon to reveal an airy, light meringue that was satisfyingly chewy and, even better, tasted like Nutella. 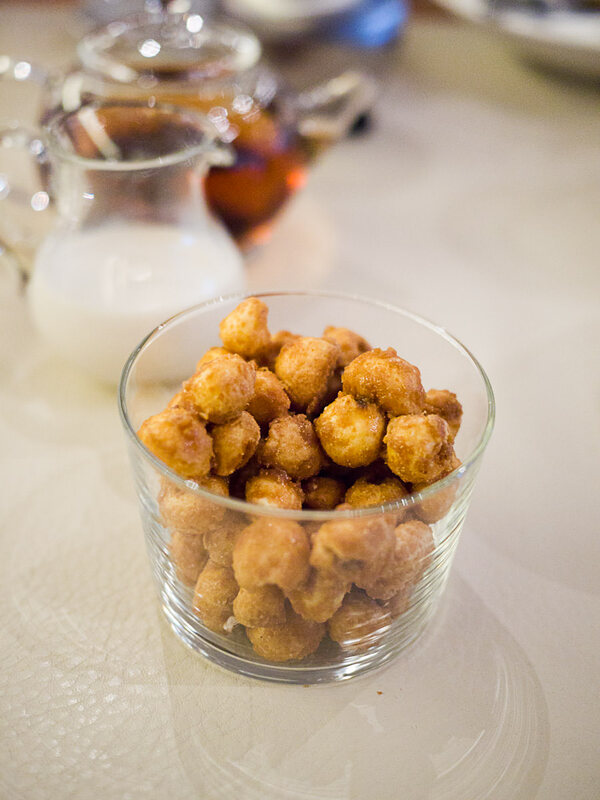 The complimentary caramel popcorn served with our coffee and tea reminded us of Lolly Gobble Bliss Bombs (an Australian product similar to Cracker Jacks). It was extremely moreish. Watching us grabbing clusters of popcorn, you would never have guessed we’d just eaten a three course meal including dessert. 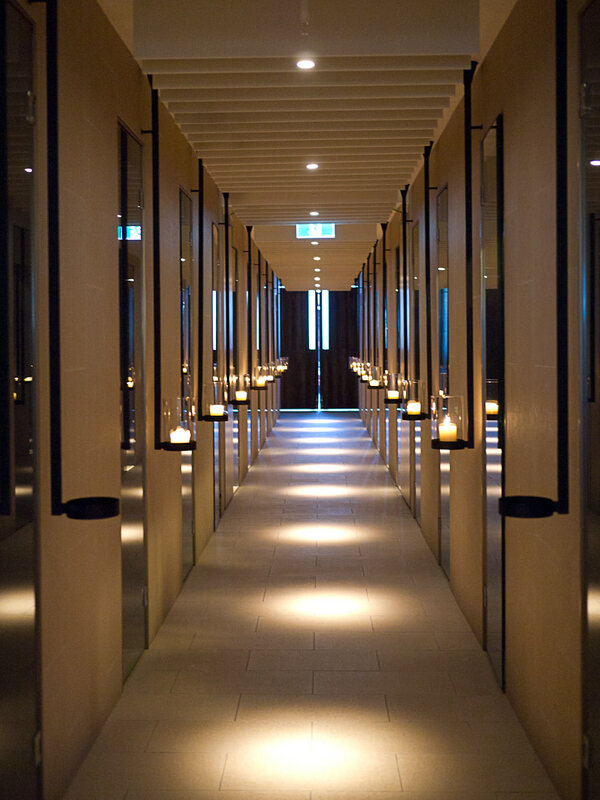 Rockpool’s entrance is grand and imposing, with a massive, heavy-set doorway. The day’s restaurant and bar menus are displayed on either side of the wooden double doors. The space has been completely transformed and bears no resemblance to the food court that used to be there. Once inside, you walk down a candlelit corridor lined with artwork towards the next set of doors. As we got closer to the restaurant, artwork was replaced with views of the wine cellar and of the meat in the custom-built ageing room. Despite not being much of a steak eater, I found this an awesome and exciting sight. 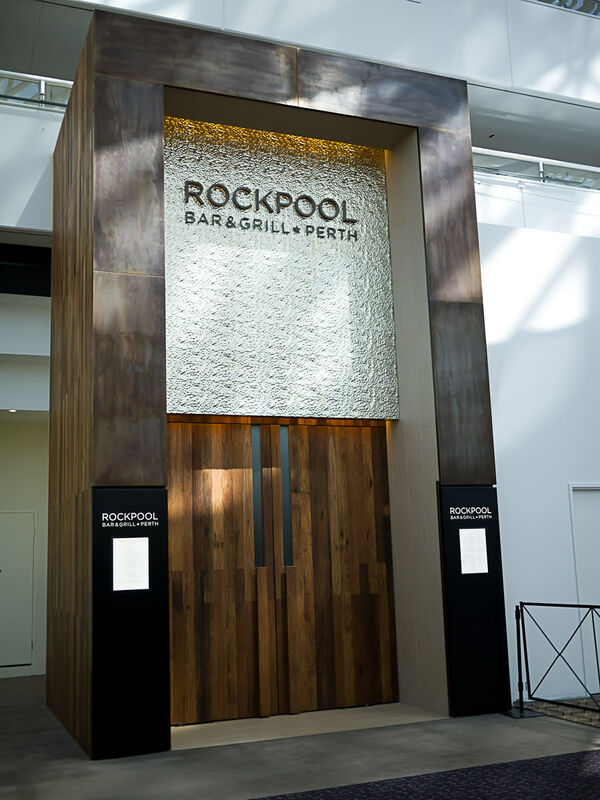 Rockpool Bar and Grill Perth has a 180-diner capacity, including two private dining rooms and a 58-seat bar. 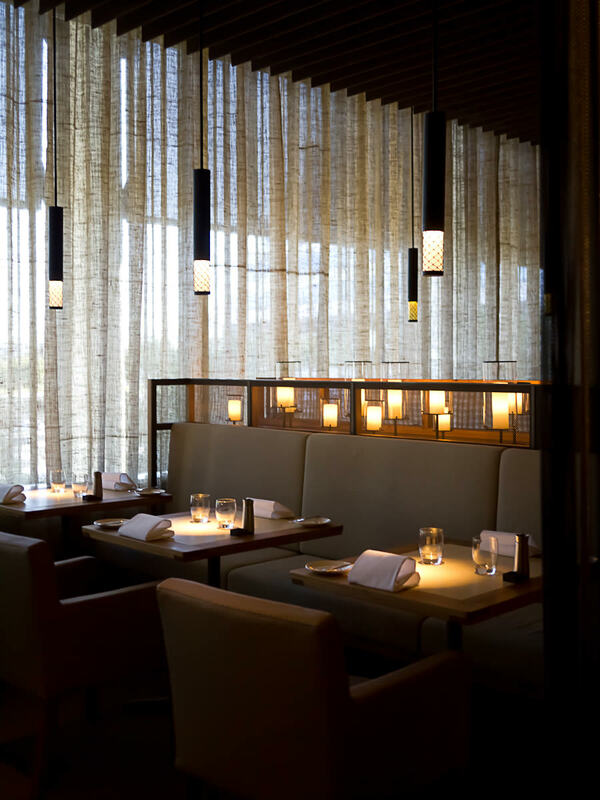 The spacious dining room is elegant and opulent, with soft lighting and natural shades of gold, olive, cream and wood. 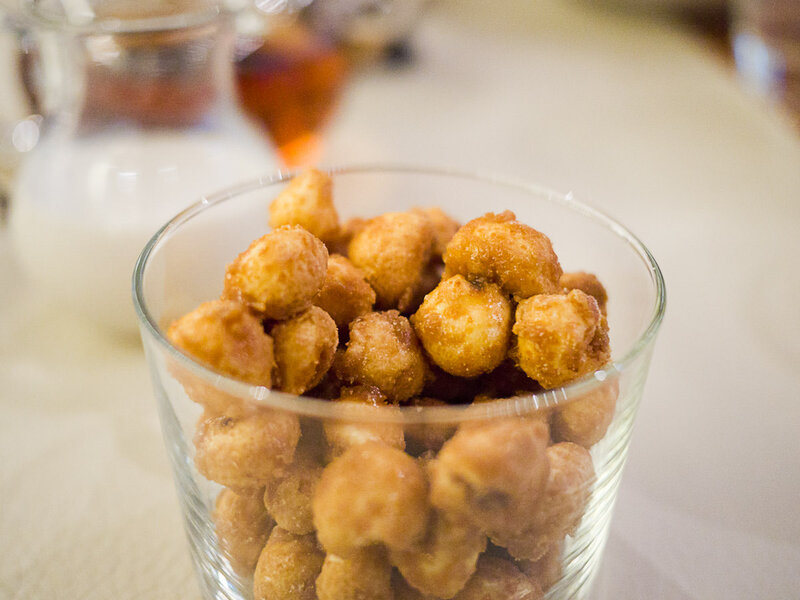 The bar menu features starters, main and side dishes and desserts. Off the bar menu I’d like to order the wagyu hamburger with bacon, gruyere cheese and Zuni pickle (AU$24) with onion rings and house-made ketchup on the side (AU$9). Our table had a good view of the large open kitchen. Throughout the meal, I found myself mesmerised by the sight of the flames licking up from the woodfired grill. We were all intrigued by how quiet the busy kitchen was. 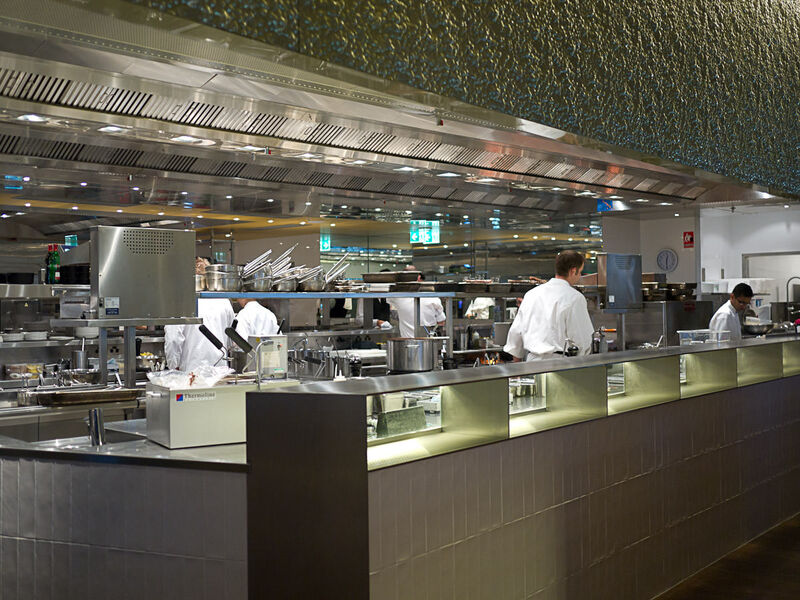 We noted and liked that the pass was at the back of the kitchen, which no doubt contributed to the unobtrusive operations of both kitchen and service. 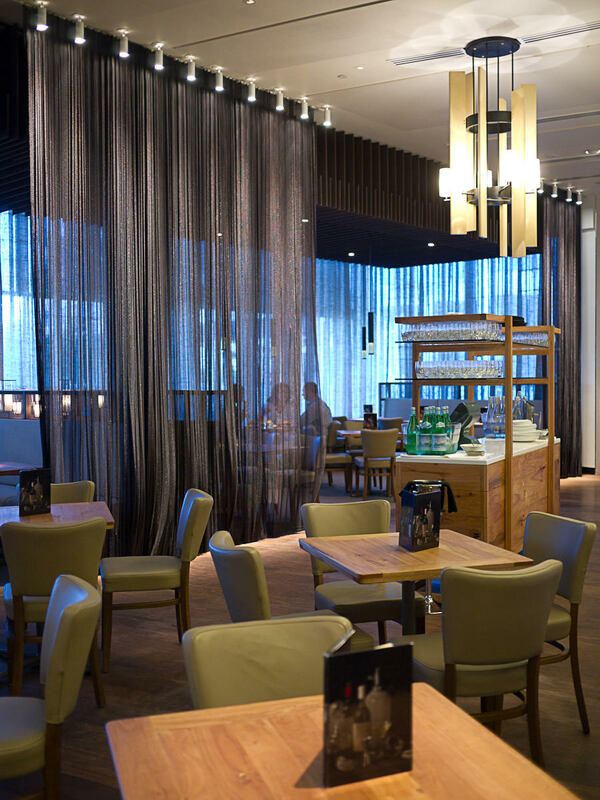 If you don’t really care about being able to watch the kitchen at work, the seating beyond the fine mesh drapes offers a more intimate setting. 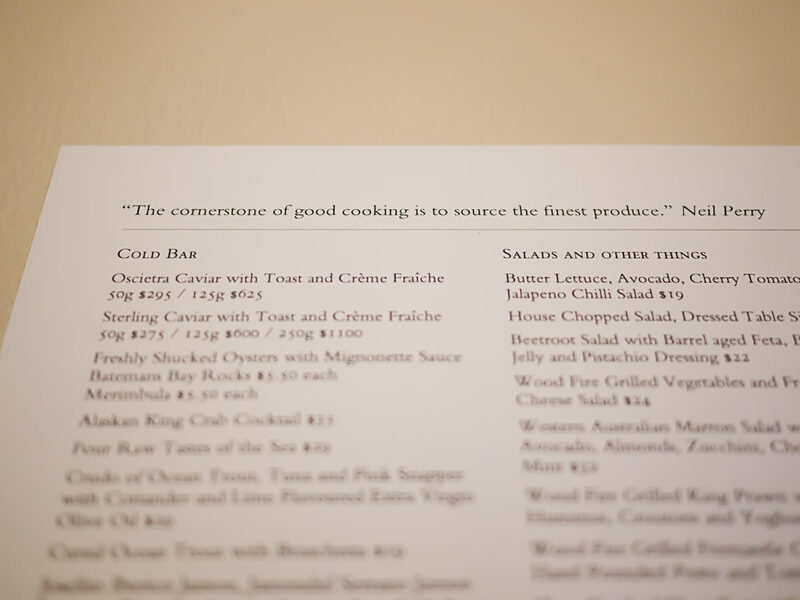 The restaurant showcases top-quality produce. 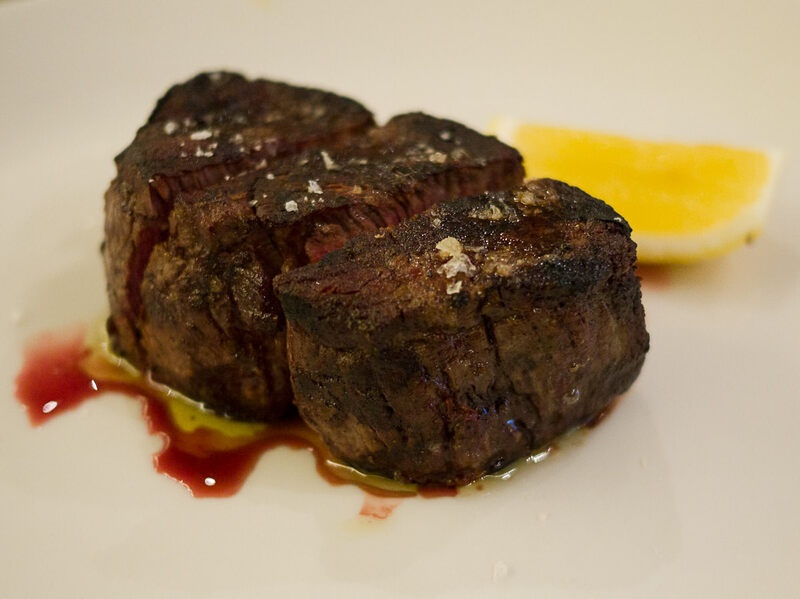 The beef is all Australian, expertly aged and prepared on the premises. 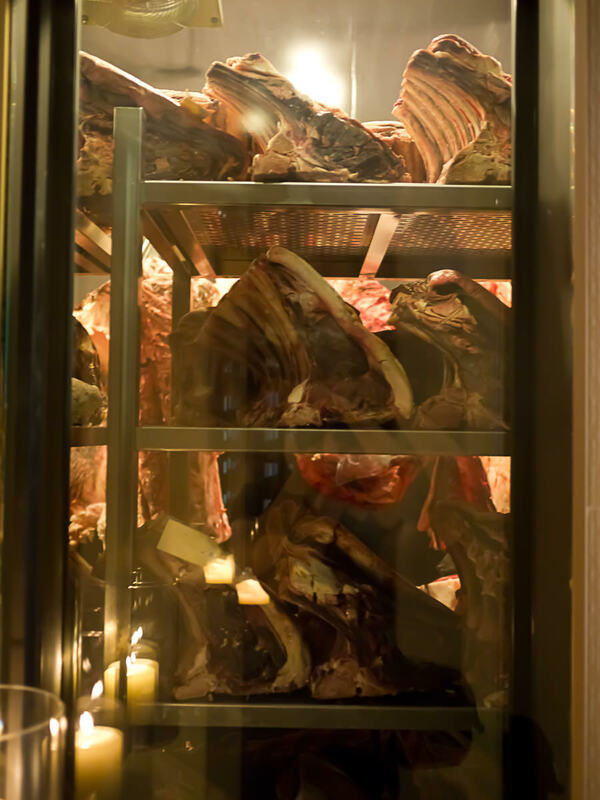 Rockpool Bar & Grill has its own butcher and there are five tonnes of meat in its specially constructed ageing rooms at any one time. Local produce features prominently on the menu, including Western Australian lobster with herb butter (a dish suitable for two), WA marron salad, charcoal roast Rottnest scallops (scallops weren’t on the menu the day we dined – yet another reason to go back) and Mount Barker free range chicken. 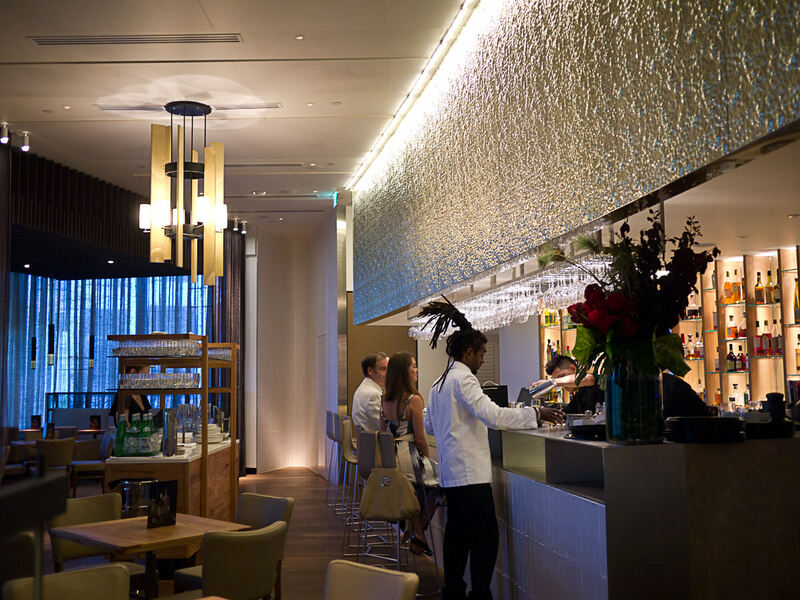 Rockpool Bar & Grill is not cheap, but we definitely got what we paid for – the seafood was sublimely fresh and exquisitely presented, the beef cooked with precision and superb in its simplicity. The menu’s “millionaire items” are the two caviar dishes, with the largest serving of Sterling caviar (250g) topping the list at AU$1100. For those of us who balk at expensive fish eggs, other dishes start around AU$20 all the way up to the WA lobster for two at AU$198. Steaks range from AU$49 for the 25-day aged skirt steak (240g) with most hovering around the $50-$60 mark. David Blackmore’s 25-day dry aged full blood wagyu sirloin (200g) tops the list at AU$119. The extensive menu will certainly delight red meat carnivores, but there are plenty of options featuring white meat, seafood, pasta and vegetables that should appeal to just about everyone’s palate. Would we go back? Yes, without hesitation! 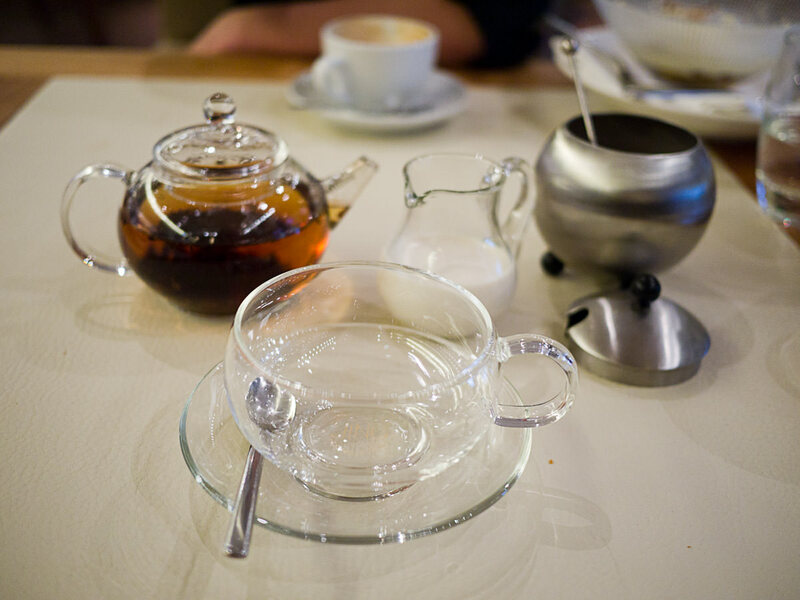 In fact, we discussed what we’d eat on our next visit – as we drove home from the restaurant. 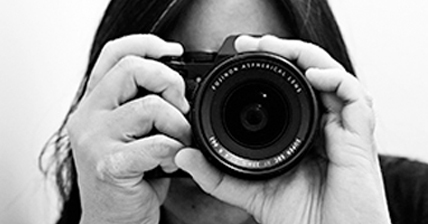 Read Juji’s write-up at her blog.